Italy is a country traditionally connected to the production and consumption of walnuts, so much that some areas (Nogara, Noceto, Nogare and many more) take their name from the centuries old presence of this cultivation, as weather conditions are naturally favourable to its development. Throughout the years, walnut consumptions have increased, whilst the cultivation considered to be marginal has not been renewed in the variety and agronomic technique, so Italy is currently a country which imports walnuts to meet its internal demand. After thorough investigations, Nogalba has gathered Agriculturists who believed in the opportunity of investing in a product which has a good market price and it is not supported by community aids in a progressive contraction, whose cultivation is entirely mechanizable. 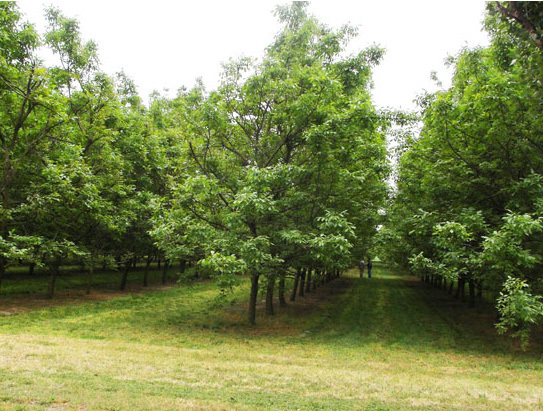 The cultivation of walnut-trees is an important commitment: Nogalba’s walnut groves are specialized orchards, the oldest of which, in the year 2008, are 20 years old and they are very far from being tired of producing, whilst the younger ones are 3 years old and are just about to get into production. When one wants to make a long-lasting investment, it is necessary to bear in mind all the acquired knowledge and to pay a lot of attention to the innovations and scientific information at disposal. 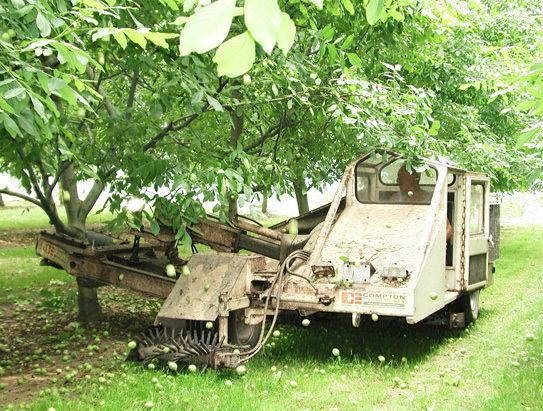 Every orchard plant goes through an analysis of substratum which is going to house it, the soil: walnut-trees love deep soils, which have a high draining capacity, with active limestone not higher than 3-4%, and well levelled in order to allow mechanical harvesting and irrigated to allow a constant production both quantitatively and qualitatively. The bedding of plants normally takes place in winter at variable spacing, between 4 and 7 meters on the row, depending on the variety and strength of the rootstock, in rows 7 meters away from each other. For the first two years, it is possible to carry out a herbaceous cultivation, (i.e. soy), and from the third year onward, the grass, which will have to be maintained for the duration of the orchard, will be sowed in lanes. The pruning of plant breeding, which is only carried out for the first three years by the plant, is done manually and it does not take more than 20 hours/ha for the entire period (on average 6,5 hours/ha per annum). From the fourth year onwards, the pruning will only be mechanic. Values reported in the schedule refer to the 2007 crop. 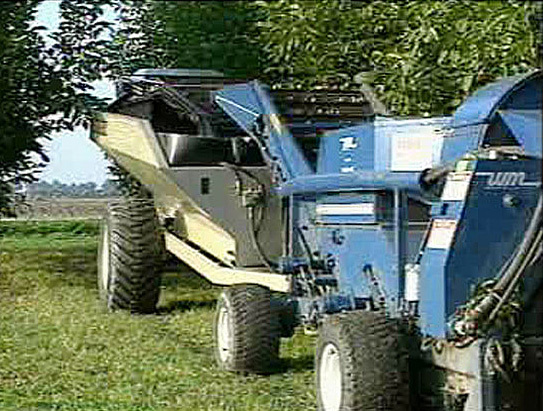 Nogalba has collaborated for many years at a technical and experimental level with the main Italian and French walnut-trees producers, with the Istituto di Patologia Vegetale (Vegetable Pathology Institute) of the University of Rome, with the Istituto Agrario di San Michele all’Adige (Agricultural Institute), with the main production companies of plant protection products, and it enjoys the precious advice of Steven Sibbett (Farm Advisor Emeritus – University of California). Thanks to this complex network of relations, we obtained great results which improved and will improve our knowledge and agronomic technique with the aim of seeing our professionalism and fruits of our labour grow. We have previously mentioned the fact that manual pruning is carried out until the 3rd year. 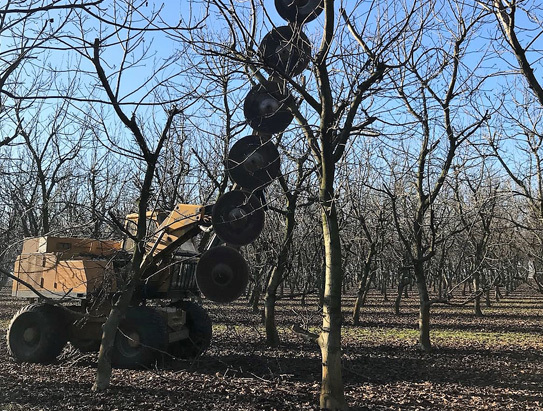 Instead, from the 4th year onwards, the mechanic pruning operations are carried out in winter by a subcontractor with special equipment with which he cuts branches (hedging) and chops, in the rows, the remains of the pruning itself. The walnut-tree is an undemanding plant, but to get a good qualitative and quantitative yield of the orchard, a correct manuring is fundamental: the demand is normally satisfied by means of distribution of about 90-120 units of N (Nitrogen), 150-200 of K (Potassium) on the ground and/or leaves, and by means of integration of minimum quantities of Zn (Zinc), Mn (Manganese), and B (Boron). Anyway, the soil analyses and better still, the leaf analyses allow to modulate doses and the quality of fertilizers connected to the nutritional state of the single orchards. In spite of what we might consider, the walnut-tree is subject to diseases and damages by insects which must be kept under control by means of a suitable phytosanitary defence in order to avoid a product loss. We need to worry about fighting against bacterial diseases (ex. Xantomonas J.) and fungi diseases (ex. Brown Apical Necrosis owing to Fusarium sp. and Alternaria sp., and Anthracnose ): 2-3 treatments with cupric products mixed with Mancozeb, and products based on Tebuconazole are normally enough for controlling the above mentioned diseases; among insects, the Carpocapsa is the one which causes the greatest damages and its control is gotten with 2-4 interventions during first-generation and 2-3 in second-generation. Overall, therefore, it is required to make between 8 and 12 treatments during a cultivation cycle. An integrated fight is at the base of our defence strategies for the environment, that is why we adopt anticipatory models able to alert us on the risk of infections owing to pathogens and insects attacks: these models allow us to intervene only when it is necessary and with balanced products depending on the presumed dangerousness of the problem. A wise running of the irrigation allows to obtain a high quality production, reducing stunted kernels, besides increasing the calibre and quantity of walnuts: when and how much to irrigate depends on the observation of the water balance of the cultivation, integrated with sophisticated information deriving from the monitoring on the state of equilibrium of plants carried out with a pressure chamber (SWP) supplied by Nogalba. The walnut-tree cultivation uses in our environment up to 7mm/gg of water and the critical period goes from early days of June and August. 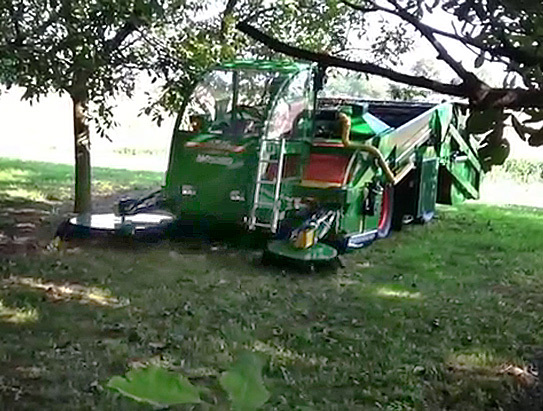 During the first decade of September, walnuts are ripe and the harvest, completely mechanic, is carried out on one’s own or among associated producers: it can be done with two types of harvesting cultivar, which first take care of the mechanic shaking of the plant and then of the picking fruits from the ground or with just one self-propelled machine or with a single mowing machine and picker carried and hauled by all-purpose tractors. A more expensive single cultivar (of Californian production) can pick in our environment up to 60 ha, whilst a cheaper associated cultivar (of Italian production) can pick up to 30 ha. Nogalba has both cultivars: the single ones are at service of firms that have joined in the purchase and share its running and costs, the associated ones are at the service of individual companies. 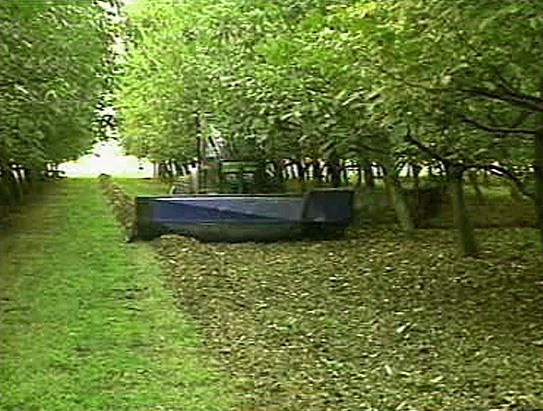 Nogalba’s partners who did not want or could not become mechanized autonomously have chosen to pool in order to purchase a harvesting cultivar: this way, it is possible to have orchards of reduced dimensions, provided that there is one or more partners with whom to share the initial investment. Harvesting takes place according to a precise delivery calendar arranged by Nogalba in order to guarantee the maximum opportuneness safeguarding the quality of walnuts, whilst transport towards Nogalba’s processing centres takes place with the means put at disposal and coordinated by Nogalba itself.